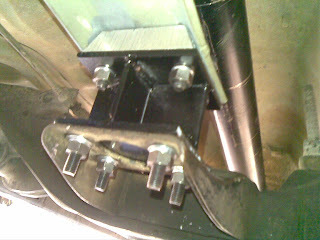 Malcolm Faed's Blog: Engine Mount and Driveshaft installed. This is the view looking up from under the vehicle. The drive flange is the grey part. 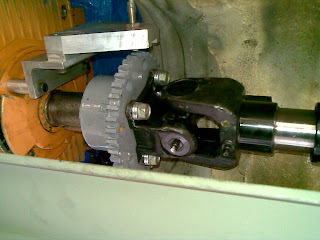 The Universal and sliding spline are bolted to the drive flange. I spent ages looking for 10mm x 1mm pitch bolts. I should have gone to Toyota first. They were just a couple of dollars each! This is the rear mount that attaches to where the gearbox used to attach.